Kenyan and Africa SACCO and Co-operative leaders will be attending the International Co-operative Summit in Kenya. Managing Director Terry MacDonald will be attending and speaking at this event. "Transformative Development: Harnessing the Cooperative Entrepreneurship in Realizing a Sustainable Economy"
African SACCO leaders are attending this conference between Oct 27 thru to the 31, 2014. In case you missed it here are some of the highlights from the most recent summit. Each video is only a few minutes long and highlights topics covered during each day of the event. Some 3,000 co-operators from around the world attended. Oct 7, 2014 - Co-operatives employee 250 million people. Oct 8, 2014 - In areas such as health care – co-operative can play and are playing an important roles. Oct 9, 2014 - Co-operatives are innovators, active in solving many of the world’s social and economic problems. During this event I will be speaking on "Secrets of Leadership and Management Effectiveness in Co-operatives", as well as "How You Can Use Technology to Connect to Co-operators Around the World". 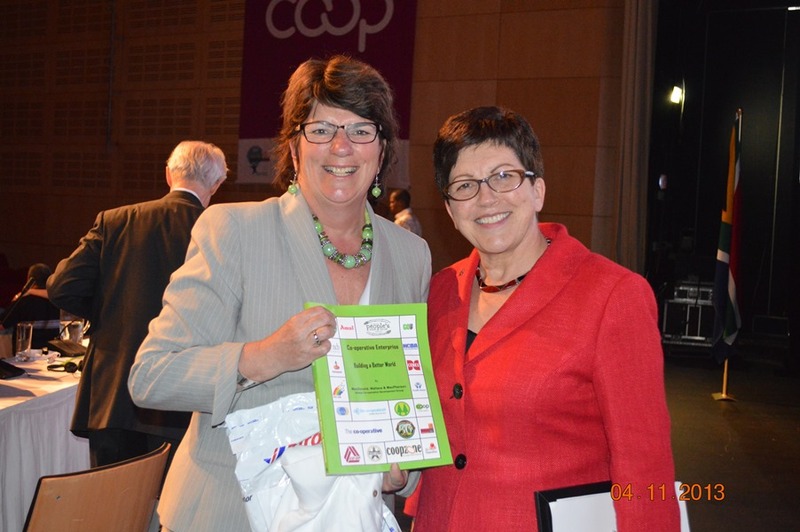 Canadian Co-operative Association Executive Director Denyse Guy presenting a copy of Co-operative Enterprise Building a Better World to International Co-operative Alliance President Dame Pauline Green during the November 2013 ICA Global Summit in Cape Town, South Africa. We are greatly saddened by the loss of our friend and fellow co-operator. He has worked tirelessly with us for almost three years on our "Co-operative Enterprise - Building a Better World" book project - which was just completed last month. He also served as as the president of our small development co-operative know as the Global Co-operative Development Group Inc. In Ian's spirit we are proceeding with the formal global webinar book launch which he helped to plan on the morning of November 20, 2013. We felt it appropriate to include a message sent by the Executive Director of the Canadian Co-operative Association to all its members concerning Ian's passing. Also below please find a link to the memorial blog which CCA has set up in Ian's memory. It is with profound sadness that I am letting you know that Ian MacPherson, Canada’s foremost co-operative historian and former president of CCA, died suddenly on the weekend at age 74. Ian was one of the Canadian co-operative movement’s leading lights, a scholar, a teacher, a friend and a passionate co-operator. He had a close relationship with CCA, having served as its first president following the 1987 merger of the Co-operative Union of Canada and the Co-operative College. He also was the author of A Century of Co-operation, the commemorative book published by CCA in 2009. Ian touched the lives of many co-operators from across Canada and around the world. He chaired the ICA committee which revised the co-operative principles in 1995, and most recently was promoting an international initiative linking co-operative to peace and social cohesion. On a personal level, he served as an inspiration to many, many individual co-operators; he was a mentor to me for more than 15 years and provided wonderful and insightful guidance that I will always cherish. 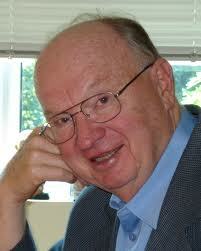 I have sent a message of condolence to Ian’s son Andrew on behalf of the CCA board and staff. The family is thinking of having a celebration of Ian’s life in Victoria early in the new year, and I will keep you informed. In my office, we are assembling your thoughts and condolences that will send to the family. I will also be talking to the Board of Directors and staff about developing a proposal for a scholarship fund in Ian’s name, in recognition of his enormous contribution to co-operative education. Ian will be truly missed by all of us. A new book entitled CO-OPERATIVE ENTERPRISE - BUILDING A BETTER WORLD is now available! Please take a moment to check out this new book... which many of you over the past two years have helped to create. We have not yet had time to organize a formal launch party... so only a few people know about it! We'd appreciate you sharing the news with your colleagues and friends. You can find this book in both printed and electronic form on various vendor websites such as Amazon and Barnes and Noble. We tried to price the book as low as possible and in the end hopefully recover our investment into it. Prices are less than 20 dollars for the printed version (8.5" x 11" with 220 pages), and less than 10 dollars for the ~385 pages epub version. Be sure to also watch for vendor discounts and special shipping offers. If you have read the book please provide an online review. Readers are also invited to share their views and ideas on the topics presented within the book in our blog or within our forums area.